First, go to /Library/Widgets and find the Stickies one. Copy it to ~/Library/Widgets and name it myStickies (or something else). Close the Stickies widget in Dashboard. Now, go to the myStickies.wdgt version you copied and right-click it. Choose Show Package Contents. 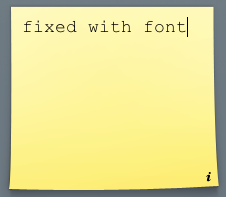 Now, open (from the same folder) Stickies.html in an HTML editor (TextWrangler works). <select id='font-popup' class='popup' onchange='fontchanged(this);'> (should be about line 40). Below that, you'll find a bunch of lines similar to each other, each beginning with <option value. Copy the one for Gill Sans, and paste it below itself. Edit it to say <option value ="Courier New">Courier New</option>. Open Terminal and type killall Dock. This restarts Dashboard. Now, double click the myStickies widget file you made. It will open in Dashboard. Follow the normal procedure of clicking the i and changing the font. You'll have a Courier option, and it will be that font. How to type monospaced numbers using system font in macOS?